Traditional tortilla chips and salsa public domain photo courtesy PD Photo.org: Tortilla Chips and Salsa. "Salsa” is the Spanish word for sauce; in southwestern cooking, it refers to a relish or condiment that accompanies a meal - a mixture of chopped vegetables (usually including onions, peppers, tomatoes), and seasonings (particularly garlic and cilantro) that may be raw or cooked. 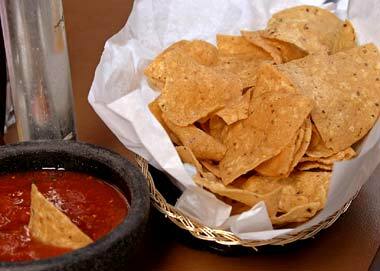 The primary ingredients used to make tortilla chips and salsa have nourished the people of Texas for centuries; corn, peppers, and tomatoes are all foods that originated in the western hemisphere and were being cultivated by native Americans along the Rio Grande when the Spaniards (who introduced onions to the New World) arrived. The first tortillas, which date about 10,000 years BC, were made with dried, ground kernels of native corn - invented by a peasant for his hungry king in ancient times (according to Mayan legend). Native Mexicans commonly use tortillas as eating utensils. "Cowpokes" of the Old West also filled them with meat or other foods as a convenient way to eat around the campfire. Traditionally grilled on earthenware utensils, tortillas are a flat, unleavened bread, often filled or stuffed with meat, frijoles (beans), or other ingredients. The word 'tortilla' was given by Spanish conquistators. 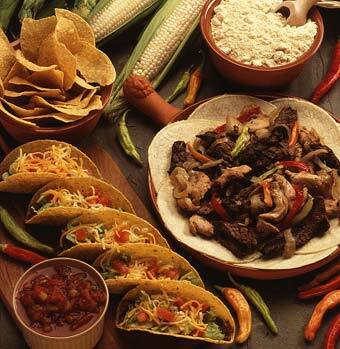 Tortillas are used to make enchiladas, tacos, and many other popular Mexican and Tex-Mex dishes. When wheat flour became readily available in the 1930s, flour tortillas began to replace the corn tortilla in Southwestern kitchens (because they are easier to make). Hand-made corn tortillas have become a rare treat. RESOLVED, That the 78th Legislature of the State of Texas hereby designate tortilla chips and salsa as the official State Snack of Texas. 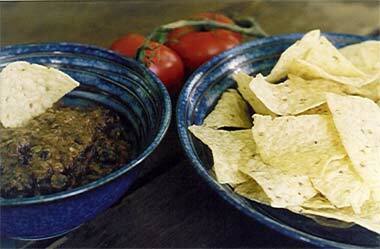 Tortilla chips & black bean salsa photo © John Martin Taylor: Hoppin' John's (all rights reserved; used by permission). Tortilla chips, salsa, tacos, fresh corn, corn meal, fajitas, and dried peppers; public domain photo by Scott Bauer/ USDA ARS Image Library.